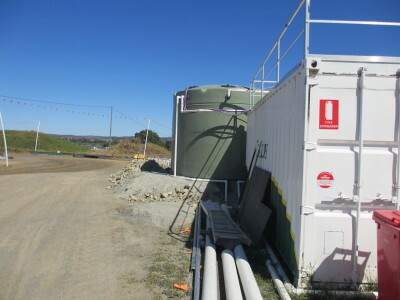 Alpha Concepts implements changes to improve nitrogen removal on SBR Sewage Treatment Plant. Sequence Batch Reactors (SBR) are problematic and less effective in the removal of nitrogen, particularly when nitrogen loadings are high as is experienced with mining or accommodation camps. This week Alpha Concepts adjusted the air supply to the first aeration cell of two SBR plants that run in parallel. Air was adjusted to enable mixing; however, to reduce DO so as to create an anoxic zone. In addition sugar addition was implemented to facilitate the denitrification process. PLC control for the site had the plants interlinked which caused process operational problems where aeration could not be adjusted for 50% of the SBR cycle. This PLC connectivity was removed allowing a greater degree of freedom of control. Aeration now represents 30% of the SBR cycle now allowing for promotion of conditions for denitrificaltion. Stay tuned to discover the impact of these changes on reduction in total nitrogen. If you have a problematic sewage treatment process that is consistently not achieving release parameters for total nitrogen, contact Alpha Concepts for a solution to your problem.